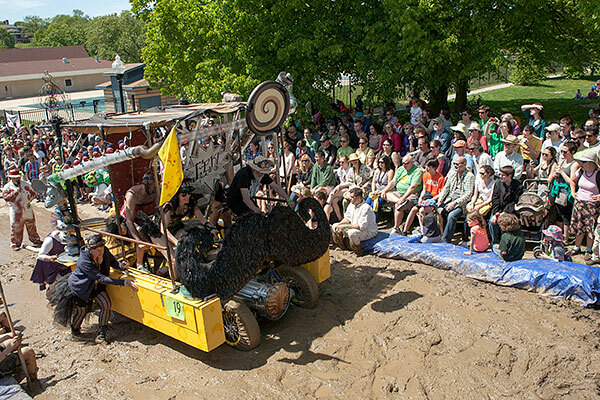 Baltimore Kinetic Sculpture Race: 2013 Race Report: Champion: Eek! 2013 Race Report: Champion: Eek! What a spectacular day in Baltimore! 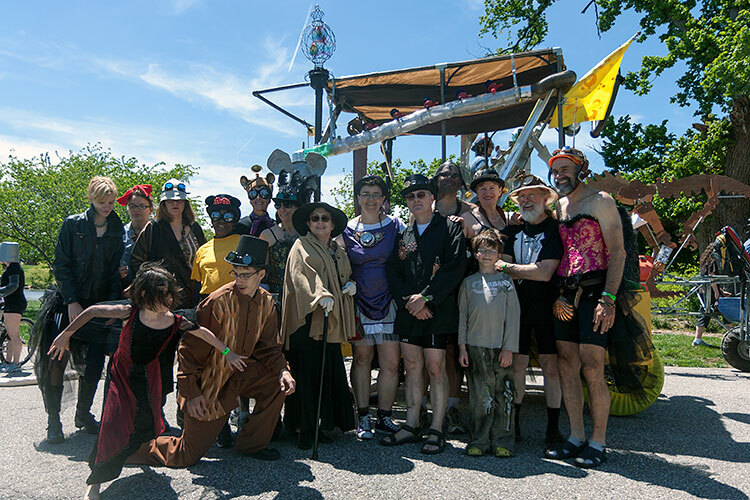 In perfect weather, a record 31 teams raced 38 sculptures (plus 1 team who came without their sculpture after it met an untimely end along US-40). Two volunteers who met at the mud pit for an earlier race became engaged after Fifi brought the ring for a very kinetic proposal. 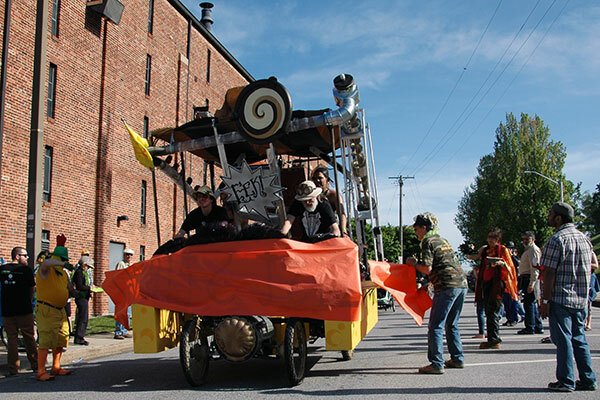 The American Visionary Art Museum ensured that scores of volunteers helped thousands of spectators have a fun, exciting, and safe day. Thematic coincidence also provided two dinosaur sculptures, two crab sculptures, two dedicated to Rube Goldberg, and two costumed Fred Flintstones. Brand-new teams competed with veteran wonders on the 14-mile racecourse over pavement, harbor, sand, and mud. 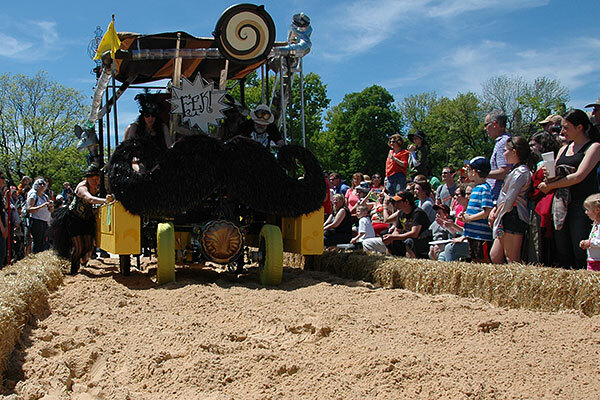 Winner of the 2013 Grand Mediocre East Coast Championship is Eek!, an amphibious human-powered oversized Rube Goldberg mousetrap. The mouse on the trailer rotated round and round. Completing the morning southern loop, Eek! 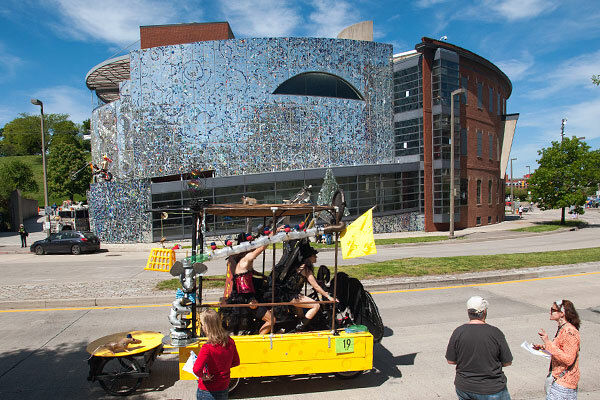 passed the Kinetic Host American Visionary Art Museum along Key Highway. 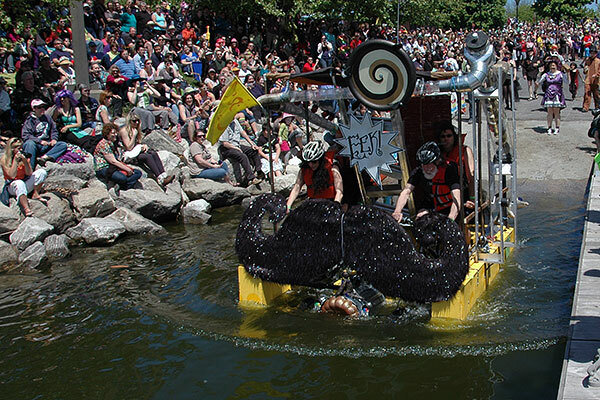 Entering the water is far easier than exiting; Eek!’s smooth water exit exemplified the robust engineering needed for a solid kinetic sculpture. For sand and mud, their tire covers didn't provide enough traction to avoid having to push—pushing disqualifies a team from receiving an ACE, but not from the Championship.